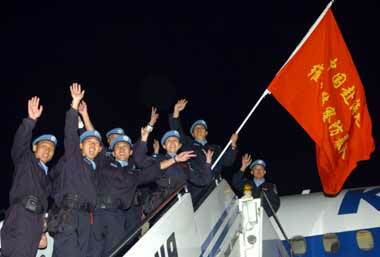 Ninety-five Chinese riot police, including 13 women, left Beijing for Haiti on Sunday, the first Chinese troops to be deployed to the Western Hemisphere. A small advance team left China last month. "This is a very hard task but we are full of confidence to succeed in this mission," one woman officer told state television. The force has spent three months training and passed exams administered by the United Nations. Specially trained for riots and crowd control, the force will join up with a multinational force on the troubled island. "This is our country's obligation in safeguarding world peace. China, being a responsible major country in the world, should play such role," Vice Minister of Ministry of Public Security Meng Hongwei told state television. China has participated in peacekeeping missions since 2000 in East Timor, Liberia and Kosovo, among other places, but it has never sent combat troops. The 125-member team will have its work cut out in Haiti where about 50 people have been killed since September. Its capital Port-au-Prince has been beset by violence between ex-soldiers who helped topple President Jean-Bertrand Aristide and supporters of the exiled leader who fled on Feb. 29 after US and French pressure to quit. Brazil is leading a UN force that numbers about 2,600 soldiers. It is a fraction of the 6,700 troops and 1,600 police authorised for the mission to stabilise Haiti after the February revolt in which more than 200 people were killed. Peering through the smog: Can cars be clean?